Professor Oyler: Chancellor Tisch Must Go. Many parents and educators across the state share my concerns about Chancellor Tisch’s leadership. Tisch has been steering the Regents reform steam boat and has pressed the accelerator while blasting through the ocean of public education by watering down sound educational policies and practices replacing the same with untested, unproven pedagogy in our classrooms. Chancellor Tisch has had a large hand in the demise of the quality of public education offered to our kids. For some reason, the Regents particularly Tisch have remained fairly insulated for their actions. Just recently, several of the incumbent Regents were replaced providing parents and teachers hope that the shift in dynamic, will restore good decision making at the Regent level. I hope Chancellor Tisch gets the message. If not, perhaps we should be making it very clear. Some brave, sage educators have already started on the quest to speak out against Chancellor Tisch’s harmful educational policies. Merryl Tisch recieved an Ed. D. from Teachers College at Columbia University. But, not everyone at Columbia agrees with Tisch on education policy nowadays. Thanks, surfer, for your warning about president of TC Susan Fuhrman and Merryl Tisch. I have been 100% up front with Susan Fuhrman about my analysis of the utter destructiveness of M. Tisch’s policies on children and teacher. “Darkest days for education” in NYS: without a doubt. I wrote to President Fuhrman the day that Tisch announced her apartheid proposal for NYS. I asked her to tell Tisch what she is doing is wrong. I was also very vocal to President Fuhrman about TC awarding a medal of honor to a person who was working to roll out a system of teacher evaluation that was unjustifiable in terms of what the evidence clearly shows. In this post Diane Ravitch called me brave. I disagree with Diane; I am not brave. I have tenure. The brave people, I think, are the TEACHERS OF CONSCIENCE (https://teachersofconscience.wordpress.com) who are refusing to give the tests. Civil disobedience is called for when complying with the law means you are breaking a higher law. Teachers of conscience are breaking a law – and jeopardizing their jobs – because they are refusing to enact an injustice. 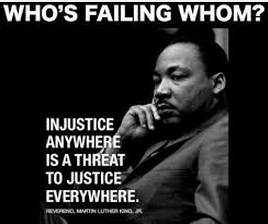 Across the history of the United States we have countless stories of everyday people who witnessed injustice and stood up and sad, “Basta! No more! Not in my name. I will put my body on the gears of the machine.” That is brave. Chancellor Tisch needs to go. If you agree, please start speaking out and calling Tisch out as Dr Oyler has done. 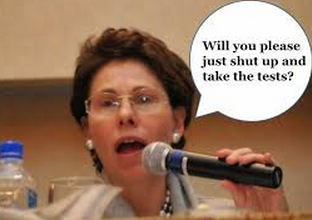 Parents and educators need to make some noise to hold the Regents accountable and that starts with Queen Tisch. 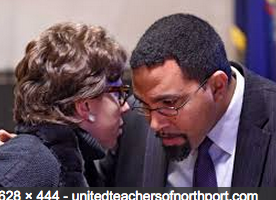 In this undated photo, Chancellor Tisch huddles to discuss the fastest and most efficient way to destroy public education in NYS schools, with former Commissioner King. As parents and educators are well aware, both King and Tisch have been incredibly successful in implementing such destructive strategies in our public schools. Next > Lawyer: Are the Common Core Tests Valid for Teacher Evaluation? Chancellor Tisch will push against public schools, teachers, and teaching just as much and as far as teachers will let her, and then some. She stands with the Wall Street crowd on education.